The C300 captures amazing imagery, don't get me wrong. 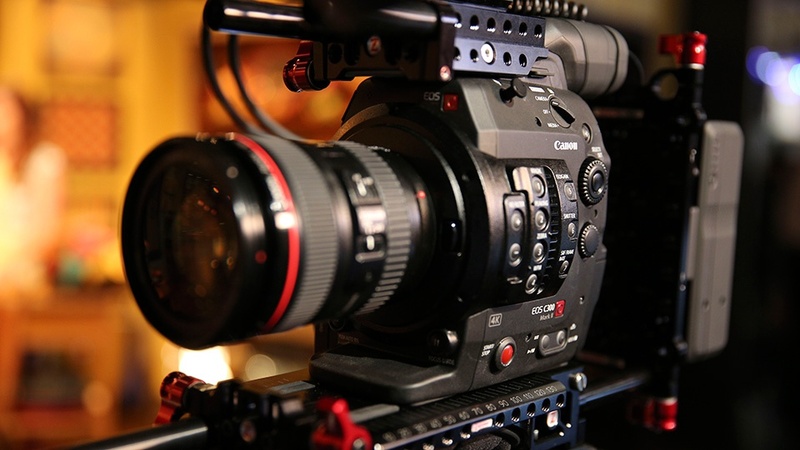 The Canon Super 35mm CMOS Sensor coupled with the Canon DIGIC DV III Image Processor yields a wide amount of dynamic range and great low light performance. However, as with any camera, there are strong and weak points. Besides the crispy clean picture you can capture with low noise and the easy menu navigation, here are some qualms that others and myself have had with the camera. Highlight rolloff could use improvement. The depth of the image suffers slightly because of this. Images tend to have less of a 3D effect. It only captures in HD (1920x1080). This definitely left the impression that Canon was "sandbagging" since the C300 was using the same 4K sensor that the C500 had. It has no high speed capabilities. This was a big drawback for a lot of people and many could not understand how Canon justified charging the price that they did for the camera. The best you could capture was 60fps at 720 HD resolution. The flimsy top handle is unreliable. Anytime I have to use this camera, I'm forced to constantly tighten the dial to keep it from loosening to the point of slipping off. Not a very good design and the material it's made of is even more questionable. It has a bad design, the shape of the body is awkward. Though the menu navigation allows me to move quickly and efficiently, the shape of the camera and weight distribution becomes an issue when rigging it up. Now that we just tore the camera apart, lets look at some of the improvements to it's successor. I'm seeing awesome results from the C300 Mark II thanks to it's internal/external design improvements. The best improvement to me was the expanded 15 stops of dynamic range and the ability to record 4K,2K,HD internally or externally (including 4K RAW output). The next best feature is the implementation of the new 10-bit Canon Log 2 Gamma which gives much more flexibility in post. Another great feature I like is the oversampled 2K/HD that reduces moire in the image and things like the improved focus assist and expanded focusing area that helps for run and gun scenarios. This is a great camera, there is no doubt about it. The C300 Mark II is not without it's own new set of flaws though, check out this interesting video highlighting the best and worst things about this new camera. Canon's Jon Sagud walks through all of the features with Zacuto's Steve Weiss and Jens Bogehegn. So the C300 mark II is definitely gonna make a splash, the question is, will it make as big of a splash as it's predecessor. I think it most certainly has the potential to as long as Canon keeps it's faithful fans and the benefits of using Sony's new line of recent cameras remains veiled to that loyal crowd. Check out some additional resources discussing camera comparisons and other useful tips to help gain more knowledge about various video production topics. The right length for video commercials and online advertisement? If you are not too familiar with the different equipment that is needed to produce professional video, take a moment to read this ebook on What Camera Package is Best for my next Video Production below. Our experts explain all of the main differences of production equipment and what equipment is recommended most for different industries.